I thought I should start with a confession. Until a few years ago, I didn’t really remember much about Joe Tex. His name might have been a little familiar to me, but if pressed I’d probably have guessed that Joe Tex was the name given to the giant robotic cowboy who greets visitors at the entrance to the Texas state fair. 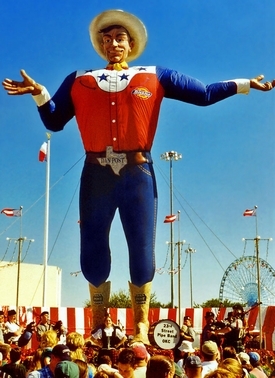 (Just for the record, that fella’s name is actually Big Tex.) But that was before I stumbled onto the real Joe Tex, an often unappreciated performer whose influence on music continues even now. My education began one day when I was looking for different versions of one of my all-time favorite country songs, “Funny How Time Slips Away.” The classic Willie Nelson piece has been recorded by a gazillion country stars, along with everybody from the Four Freshmen to Perry Como, but when I came across Joe Tex’s version I knew I was hearing something different. It was the beginning of a period that would find him enjoying success with a variety of different sounds. He was perfectly at home with conventional R&B and knew his way around a ballad, but his Texas background also gave him the ability to inject a country sound. In addition, his ability to mix in jive-talk, while clowning and preaching his way through a song, was in a lot of ways the precursor to today’s hip-hop and rap. Songs like “Skinny Legs and All” demonstrated this diversity. By the Seventies, he had converted to Islam and taken the name Joseph (Yusuf) Hazziez, although he still performed as Joe Tex. He continued to have success with songs like “I Gotcha,” and the disco-influenced “Ain’t Gonna Bump No More (With No Big Fat Woman),” but within a few years he’d begun to slow down and spend more time on his Texas ranch. He died in 1982 at just age 49, leaving behind a legacy of amazing diversity.